We Love Fine is on fire right now! Literally on the heels of their Star Wars collection, they have a brand new collection just in time for the new Avengers movie. Age of Fashion, is the brand new collection by Catherine Elhoffer, a recent addition to the We Love Fine team. 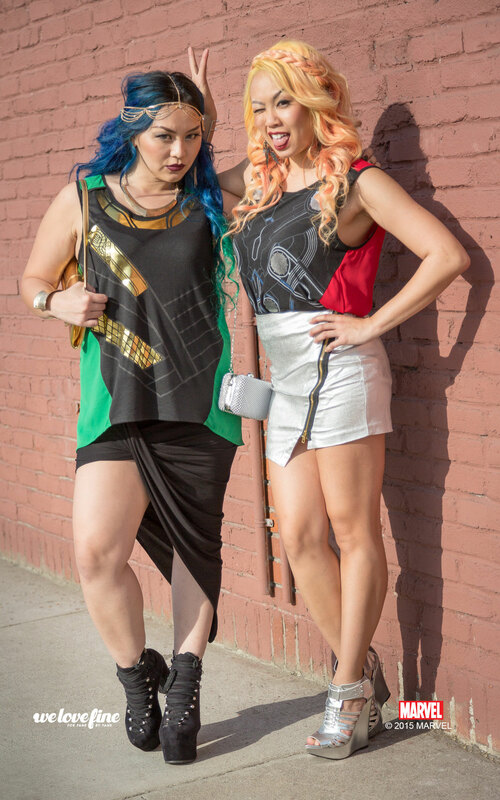 You may have seen her work worn by Ashley Eckstein in last year’s fashion show. We have an exclusive interview with her about the new line and what we can expect from WLF in the future. If these tops are any indication, I can’t wait to see what they have up their sleeves!! First of all, tell us about yourself and what your role is at We Love Fine. You’ve had some previous experience with creating geek fashions of your own. How did you utilize that experience in creating the designs for the Age of Ultron release? I was a freelance costume designer before being brought into the WeLoveFine team, and I had been dabbling in the geek fashion world by mixing different fashion styles with colors to kind of ‘Disney-Bound’ (or as I’ve been calling it, Nerd-Bound) in a variety of fandoms. I was getting great feedback from my designs, but I didn’t want to step on any licensing toes, so my designs were just one offs or just on paper. When WLF hired me, I made it clear that I wanted more than just prints on basic shirts or a-line dresses. Thankfully they were already in the same mindset, and wanted to do a lot more in the fashion world. That was where we started with the Age of Fashion line. There’s plenty more I want to bring in and start doing, but this is the just the beginning. I’ve got books full of even more inspired fashion pieces based around all sorts of fandoms. Was there a particular theme or style you were channeling when creating this collection? Did your own personal style play a role? I can’t say my own style wasn’t a huge influence in this line, because it absolutely was and is. I am in love with dolman shrugs, and the Captain America Dolman is a piece that I actually developed in my apartment last year between some film work. I initially developed it as a Khaleesi-inspired shrug, but when I started developing the Age of Fashion line it hit me that this shrug would be perfect for Captain America. What I love is that it doesn’t look like a geek piece from the front, it’s just lace and a light knit hacci. The detail is on the back. And even then, I wanted it to be the lace in the center back rather than a screen print shield. I am so thrilled with how it turned out. As for the Thor and Loki tops, I really wanted to bring in their amazing capes to the tops without actually having capes on them. I stumbled across a top online that clicked for me as a ‘OMG THIS IS LOKI’ and I ran with it from there. Initially I had been developing a different chiffon-type top for the Gods of Asgard, and I remember when I saw the top that inspired these I quickly drew up the look and ran into my Creative Director’s office practically bouncing off the wall with excitement. I wanted tops that can be easily paired with leggings, since I live in leggings. Iron Man and Black Widow tanks both revolved around me a need for some superhero tops that I can wear when hitting the gym. 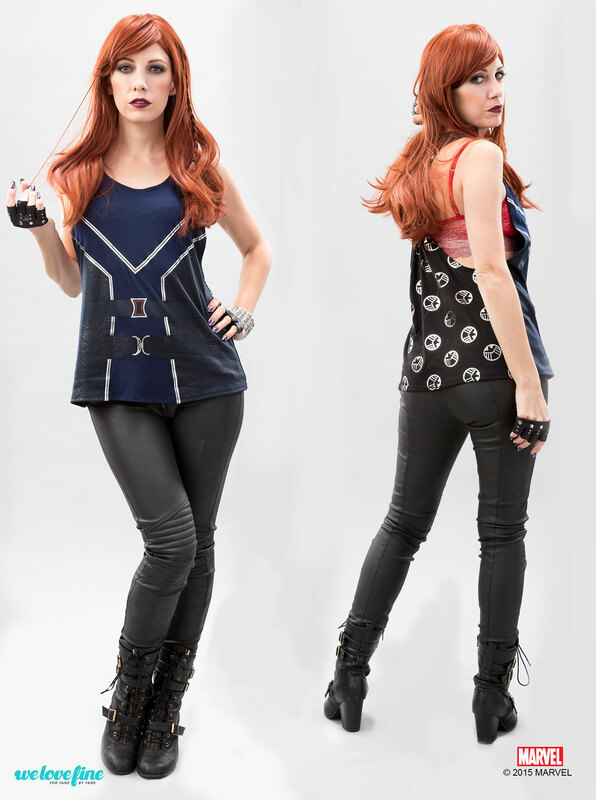 I don’t like wearing fitted tanks when sweating, and WeLoveFine already had a great tie back tank that we used on a ton of Star Wars product, so I changed it slightly to suit my own sewing tastes, and then added those prints. The Iron man top was another revelation moment; I wanted a flattering Iron Man that wasn’t his bulky chest plate that could make a woman’s figure look feminine. When I turned his detail lines into faux princess seams I was so thrilled with how it looked. And for Hawkeye, I really wanted to bring his awesome costume into the tunic. And since I’m a huge Marvel geek, and his new tunic is amazing, I had to make a similar piece for the ladies. It’s really all happening because I’m a huge geek that needs things for me. (And since I’m a bigger girl, I need things that even I could look good in). 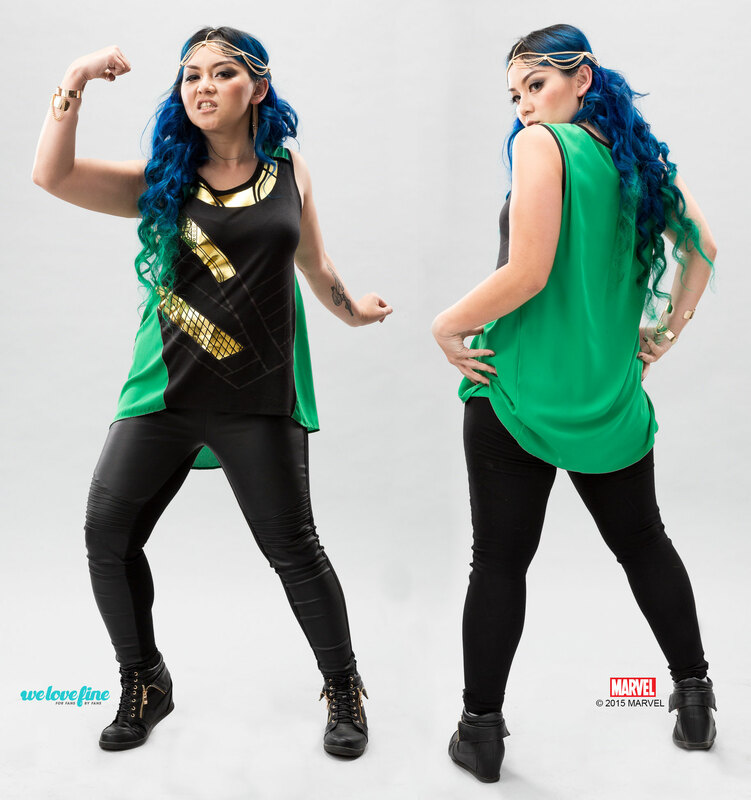 I’m super partial to the Captain America Dolman Shrug, as I designed that piece in my home studio. It’s my baby. It’s also my attempt to prove the theory I have that fangirls want fashion. We don’t just want screen print or sublimation print. We don’t just want leggings or dresses. We want layers, we want subtlety, we want fashion. As a costume designer, I was trained to take costume pieces and turn them into clothing so when you’re watching a film or show, you aren’t noticing the costumes, they’re just part of the story. I am doing exactly that at my job now at WeLoveFine; I’m taking costumes and costume elements, stripping them down to their base properties, and turning them into fashion apparel that has an end goal of fitting into daily life and our wardrobe without calling attention to it (unless we want it to). I love wearing pieces of mine out into the world and getting compliments on how cute it is from the general public, but then when a geek meets me they get to connect in a completely different way. I love meeting fellow fangirls and fanboys that way. It makes our connection so much more memorable and meaningful. Back to the original question, though (I tend to go on rants about geek fashion…), I also really love the Loki top because, um, LOKI. I LOVE being the god of mischief. I think those are my two favorite pieces, but really I’m completely in love with all of them, and all of our amazing cosplay models really rocked the shoot and had me falling for the pieces all over again! I love that we brought in ladies of all shapes, sizes, colors, and backgrounds for this shoot. They make the pieces look even more awesome! Do you have any suggestions for some fun ways to style the pieces? 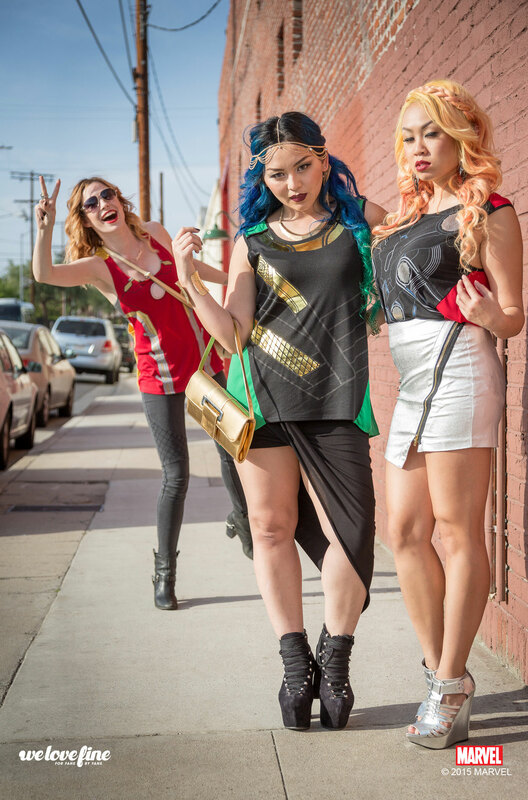 What kind of trends have you been seeing in geek fashion? What are some things you would want to pursue in the future? Well what is really great is that everyone is kind of doing their own things. I personally am pursing the professional looking side. I want to make pieces that men and women can wear to the office if they don’t have an office as laid back as WeLoveFine. Cardigans, button-up shirts, sweaters, the like. I also want sexier dresses. Right now almost every dress available for geek girls is made to junior’s sizing, and so many of us have hips and busts, so they don’t quite fit well. So all my dresses I’m working on have longer lengths and other added bonuses that I can’t talk about yet, but are making me incredibly excited. I’m not quite sure when my dresses are due out, but I know I’ll come back to you ladies to talk about them more then. I can’t wait for more to come out!! The Age of Ultron collection can only be the beginning for you. Any hints on any projects you’re currently working on? Thanks again to Catherine for answering our questions and giving us incredible insight into what goes into making a fashion line like this. I pretty much want that Captain America shrug yesterday! Which is your favorite piece? To see more photos, or pre-order, click here! Quite possibly my favorite part of of all of this is they had fans like you and me as models, stylists, make-up artists, and even the photographer (you may recognize his name from our Stunning Styles). Photos by Greg DeStefano ( http://www.gregdestefano.com/ ).